You can catch Laura reading at guest spots all over the East Coast. Intuitive tarot workshops are held on a regular basis. Check here for updates. APRIL 28: WICCA 101-BELTANE & TAURUS SEASON. What does astrology have to do with the 8 Wiccan sabbats? How can Wicca teach us to celebrate the signs and seasons? Join me for a Wicca 101 class on Beltane & Taurus Season on Sunday, April 28 from 11AM-1PM. Taurus is the earth sign of Venus and the pagan holiday of Beltane is celebrated by making merry around the Maypole. We will explore the connection between the sign and holiday, and design a Beltane ritual you can perform at home. This is the first class in a series on Astrology & the Days of Power. $44/sliding scale available. Space is limited. Sign up here. May 3-6: NEW YORK CITY. The Wednesday Witch will be in NYC the weekend of May 4. Email me to set up an in-person reading or healing. May 31 & JUNE 1: NORTHAMPTON, MA. The Wednesday Witch will be in Northampton, MA the weekend of June 1. Sign up online for an appointment by selecting the Northampton calendar. MAY 15: BEGINNERS TAROT. This three class series is designed for those who are brand new to tarot and those who want to deepen their practice. We will meet from 7-9PM on Wednesday nights. A different topic will be covered each night. 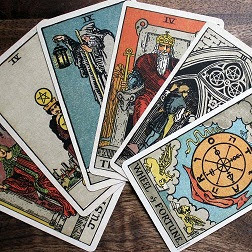 If you have never read for yourself or want to gain confidence to read for others, this class will help strengthen your intuitive sense of knowing and connection to the cards. $88 for all three classes. Sign up here. February 17, 2019: Tarot for Lovers Workshop. November 8, 2018: Scarlet Letter Club Tattoo Shop in Brooklyn, NY. October 20, 2018: ReLovv Newbury Street Pop Up Party. October 13, 2018: Spirit to Spirit Charity Psychic Fair hosted by the Cornucopia Collective to benefit the ACLU. 12- 5:00 PM at The Democracy Center in Harvard Square, Cambridge. September 15, 2018: Intuitive Tarot Workshop. Do you love working with tarot cards and want to get “off the book”? This intuitive tarot workshop will help you open your 3 eye, get in touch with your inner sense of knowing and deepen your engagement with the cards. Space is limited. Email to sign up. 1-3PM /$40 per person. No one turned away for lack of funds.